An easy vegan nutty soba noodle salad that is crazy delicious, and is perfect for dinner on a hot evening. Any leftovers are also great for tucking into the lunchbox. Combine all of the ingredients in a small bowl. The dressing will appear quite thick, and can be thinned with a little hot water if preferred. Drain the noodles and rinse with cold water. Place the noodles in a bowl of cold water to prevent them sticking together and set aside whilst preparing the vegetables & tempeh. Heat the coconut oil in a fry pan and fry the tempeh until browned on all sides and crispy. Set the tempeh aside. Drain the noodles and place them in a large bowl. Add the dressing and mix well to distribute the dressing through the noodles. Add the vegetables, chopped coriander, and crispy tempeh to the bowl. 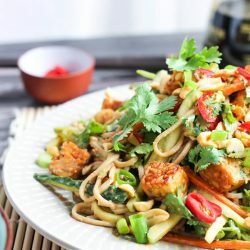 Toss the noodles gently to mix in the vegetables and tempeh, and to coat the vegetables with the dressing. I like to use my hands for this as I find it the best way to mix it together. Scatter over the peanuts and sliced chilli. *Every single packet of soba noodles I have bought has had different cooking instructions on it. Follow the instructions on the back of the packet for best results. The salad dressing will appear quite thick when all the ingredients are combined. The water clinging to the hot noodles will thin the dressing out so it can coat the vegetables and noodles. If the noodles seem quite dry before adding the dressing, thin the dressing with a little hot water. If you like chili, and don't have chili haters in the house, I highly recommend that you add it in. This salad will keep for up to three days in the fridge.